It is "factually and legally wrong" to claim that Housing Board flat buyers do not own their flats and are merely renting them, said Minister for National Development Lawrence Wong. "They can also sell their properties and benefit from any upside, or rent it out if they choose to," he said at the Peak Forum for property industry professionals at HDB Hub yesterday. Mr Wong reiterated the Government's view that the concept of leasehold property is neither unique to Singapore nor public housing. Since 1967, all government land sale sites for private residential parcels have been sold on leases not more than 99 years. Otherwise, Singapore runs the risk of becoming like some other cities where, because it is difficult to recycle the land, there is a land shortage and housing becomes "very expensive and unaffordable". He did not name any commentators, but The Straits Times had published a commentary on Aug 14 by International Property Advisor chief executive Ku Swee Yong, who recommended "that we be honest with ourselves and recognise that we are merely lessees who rent the HDB flats for their terms". On Tuesday, Mr Wong said there are other aspects of housing policies where people may have differing views, and this is fine. This includes how best to integrate rented and sold flats in HDB blocks, how much subsidies to give or how to ensure fiscal sustainability. "These are policy issues with difficult trade-offs to manage, and we welcome diverse inputs so we can consider a diverse range (of solutions) to improve our housing policies," he said. At the forum, Mr Wong announced a new design guide to ensure distinct town identities over the years to come. He also gave about 400 participants a look at the first housing district for the upcoming forest town of Tengah and launched a refreshed exhibition on the HDB's milestones at the HDB Hub in Toa Payoh. The raging debate over Housing Board flats and whether these are "owned" or merely "leased" from the Government on 99-year leases is driven by a false dichotomy. I have been following the debate as it gets increasingly heated. On one side are those who say HDB flats are merely leased. Others refute this and say HDB flats are owned, as buyers have ownership rights for the term of the 99-year lease. Online, it was distressing to see people question the integrity of the Government's home ownership policy as a result of that debate. The key thing is that when you buy an HDB flat, you own it for the remaining term of the lease. You can renovate it to your liking, sell it, profit from it, and will it to your loved ones. The flat is also purchased on a leasehold term, which means HDB remains the lessor or, if you like, the super landlord. Having the HDB remain as super landlord carries a lot of benefits to HDB flat buyers: the HDB stumps up billions to upkeep, upgrade and maintain the value of HDB flats. So, to me, the storm over owned or leased is just an intellectual storm in a teacup. It's not either-or. It's both. And that gives HDB flat buyers the best of both worlds. But back to basics: What is really at stake? At its heart, many analysts would likely agree that the key challenge in the HDB's home ownership policy today is how to maintain the value of HDB flats as they age. There are about one million HDB flats. About 240,000 flats were constructed in the 1970s, which means about 240,000 flats are aged around 39 to 48 years old. Like ageing Singapore, ageing HDB flats have the equivalent of a baby boomer bulge, with a sizeable number of middle-aged flats that will enter advanced age together in about 20 years' time. As more HDB flats enter their middle age and hit 40, 50, and 60 years of age, anxiety is rising over whether old flats can continue to appreciate or even keep their value. The issue, simmering in the background for several years, blew into the open in March last year when National Development Minister Lawrence Wong warned flat buyers against assuming that old flats will be picked for the Selective En bloc Redevelopment Scheme or SERS. Under this programme, the Government takes back old flats, gives generous compensation, and rebuilds new ones to higher density. Old flat owners can buy new flats at discounted prices - with a fresh 99-year lease. The SERS was considered a bonanza, and buyers have been known to pick flats in areas they think are ripe for such redevelopment. Mr Wong warned flat buyers that very few HDB flats will be picked for SERS, and that most will return to the Government at the end of 99 years. After all, the Selective En bloc Redevelopment Scheme, as its name suggests, is meant for selected precincts only, and was never intended as an en masse programme. Mt Wong's comments forced HDB flat owners and buyers to pause and think. Agents reported declining interest in old flats. An analysis by property consultancy OrangeTee showed a widening gap this year between average prices for resale flats over and under 40 years old. In Toa Payoh, newer flats under 40 years fetched a 65 per cent premium over older flats aged over 40 years. Concerns escalated: Who will buy old flats if they depreciate to zero value at 99 years? And what will happen to the hundreds of thousands of owners of such flats if no one wanted to buy their flats? And given that many people use Central Provident Fund monies to buy flats, how will elderly HDB flat owners monetise their flats for retirement if there are no takers for the flats, or if they are sold at a loss? It was amid such anxieties that Prime Minister Lee Hsien Loong announced two new initiatives for HDB flats at the National Day Rally last month. The first is a promise that every HDB flat will get upgraded not just once, but twice in their lifetime: once at about 30 years and another at about 60 years. This ensures that old flats remain in good condition in their second phase of life. Next, as flats reach 70 years, the Government may offer flat owners a new voluntary early redevelopment programme called VERS. If residents vote for it, the Government buys back the old flats and redevelops the precinct, while the flat owners can buy new flats. VERS in effect provides a price floor for very old HDB flats, with the Government stepping in as buyer of last resort if residents vote for it. Both HIP II and VERS are excellent ways to keep the value of HDB flats as they near the end of their lease, although concerns remain over the quantum of VERS payouts and whether the voting process for VERS may splinter communities. Why would the Government step in to announce HIP II and VERS? After all, it does not come up with similar programmes for private estates with similar decaying 99-year leases. The answer is simple: because a special relationship exists between HDB flat buyers and the Government. That relationship is based on a promise and trust. HDB flat owners hold the Government to its promise of home ownership for the masses, and of keeping HDB flats as stores of value. They trust the Government to have their best interest at heart, and to do what is right and necessary to help maintain the value of HDB flats. But in the 1990s, as the message of asset enhancement went overboard, some Singaporeans started seeing HDB flats as ever-appreciating assets. Before Mr Wong's warning, people did not factor in the age of HDB flats they bought, expecting that the Government would offer SERS, or somehow prop up their values, even as they neared the end of their leases. Last year's public discussions and anxieties over decaying HDB leases have thus been much needed, to reset expectations that were fast becoming unrealistic and unhealthy. The HDB resale market needs a dose of reality, so that both buyers and sellers take into account the age of the flats they are transacting, in addition to attributes such as location, size and flat condition. It is clear that the People's Action Party Government takes that bond of trust which HDB flat owners place on it very seriously. This explains why PM Lee announced HIP II and VERS way ahead of time - at least 10 to 20 years before these programmes will be needed. This was necessary to soothe concerns and to assure flat buyers their home values will be protected. That bond of trust also explains the alacrity with which this Government has stepped in to offer a slew of generously funded upgrading programmes in different eras. In the 1990s, there were the Main and Interim Upgrading Programmes. I recall the excitement in my family when our three-room block was picked for the MUP in 1995. I liked the multi-storey carpark, and lifts on every floor, but most looked forward to the "space adding item" at the back of the kitchen. When built, that "utility room" proved big enough to fit in a single bed and cupboard comfortably. Today, those utility rooms have been rented out for $400 a month. 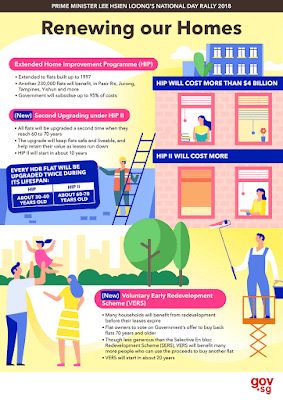 More recently, the Home Improvement Programme (HIP) replaced the MUP. 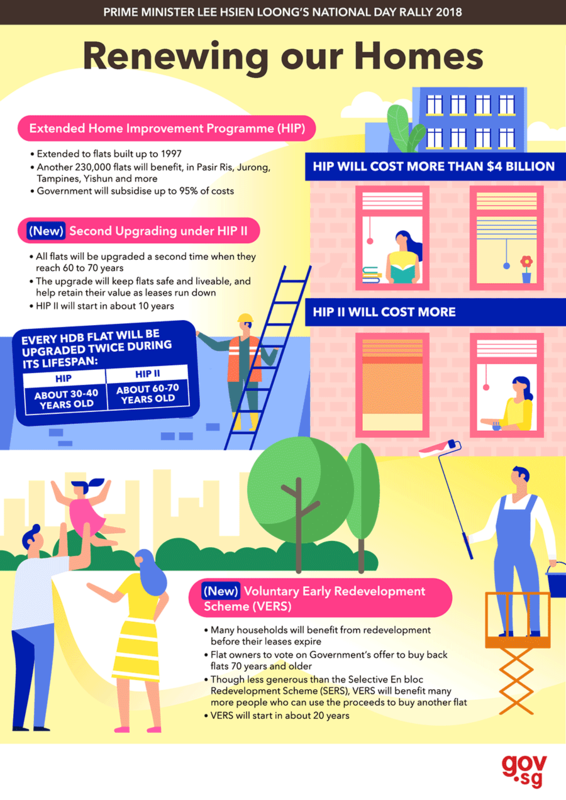 From 2007 when HIP was launched, till March 31 last year, the Government spent $1.93 billion on improvement works for older flats. Under the HIP, citizen households pay about 5 per cent to 12.5 per cent of the costs, depending on flat type, with the rest subsidised by the Government. What does HIP offer? I looked at the brochure for one such project at Bukit Merah View. An "essential" package is done for all blocks picked for HIP. It includes repairing spalling concrete and structural cracks, upgrading the electrical load, changing the waste and soil discharge stack (essentially the waste pipes in the flat) and having a new clothes-drying rack installed to replace the old bamboo pole-holding sockets. Cost to HDB flat dweller? Zero, because the $13,000 cost is fully subsidised. If at least 75 per cent vote for it, another "optional" package kicks in. A toilet upgrading package is included, giving flat dwellers a new sitting toilet, new sink and waterproofing for floors. The rubbish chute hopper is changed. You get a fireproof door and metal grille. Cost for three-roomers: $380. Subsidies from the Government: $7,220. For flats with elder members, another package offering grab bars, widening access to the toilet to accommodate wheelchairs and adding ramps to front door will set back three-room households by $100, with the Government footing the other $1,900 of the cost. Spread out in instalment payments, the amount the household pays comes up to $9.90 per month over five years, or $5.10 per month if paid over 10 years. Now if I were an HDB flat dweller, I would not be too concerned about whether I own or lease the flat, so long as the HDB as lessor is prepared to continue taking care of these upgrading works as my flat ages, and offer them at highly subsidised prices. While details on HIP II have yet to be announced, most HDB flat dwellers trust that the cost will be fair, even attractive. VERS, however, will have to strike a balance between being attractive enough to induce flat dwellers to vote "yes", and being fair to future generations. This is because the payout to take back those old flats before their leases expire has a direct impact on the prices that buyers of the new redeveloped flats have to pay. Intergenerational equity, fairness to taxpayers, and how the massive undertaking will be financed, have to be considered because the VERS programme is a mass programme for many, if not most, precincts, and will cost the Government hundreds of billions of dollars and more. To restate the obvious: HDB flat buyers have secure ownership rights, so they can live in them peaceably, sell them and profit from them. But the flats are also leased from the Government for 99 years, and the HDB remains as super landlord, stepping in to help maintain the value of the flats as they age. This dual identity of HDB flats and the assurance that the government will take care of HDB flat buyers, is one reason why I hope to retire in an HDB flat. Because HDB flat dwellers clearly can have their cake and eat it too. To enhance the distinct identities of these housing estates, the HDB will launch design guides for each of its 24 towns over the next five years. The guides will also ensure coherent development over the decades to come, Minister for National Development Lawrence Wong said yesterday as he unveiled the first guide for Woodlands, one of four regional centres identified in the Government's land use plan. Some major cities have pushed out their own guides. Seoul, for example, is said to be the first city in the world, while New York City has a street design manual to guide the improvement of streets and pavements throughout its five boroughs. Each HDB town guide will chronicle the town's vision and distinct character to help future planners and agencies unify its developments as it evolves. The guide offers design principles on three scales: the town, neighbourhood and precinct. The town layer provides the overall vision for the town such as its landmarks and how cycling paths are laid out. The neighbourhood layer sets out concepts such as the colour palette for buildings and what trees are planted. The precinct layer guides the detailed design of individual projects such as the type of playgrounds or how HDB signs look. In a statement, the HDB spelt out how each of these layers would be applied to Woodlands - a town that got its name from the numerous keranji trees along the coastline. Woodlands is also one of three towns earmarked for the third iteration of the Remaking Our Heartland rejuvenation programme. At the town level, for example, an upcoming WoodsVista Gallery is among the developments that follow Woodlands' wooded theme. The gallery will be a 1.9km-long, greenery-laden pathway that lets residents move seamlessly from Woodlands MRT station to Woodlands Waterfront. At the neighbourhood level, the town has been divided into sub-areas, each with its own theme. For instance, the guide suggests that Woodlands Central, with its "Urban" theme, should have vibrant streets, and varied and dynamic facade designs, and use light grey colours with contemporary accents of deeper greys and browns. On the other hand, Woodlands East, anchored by landmark developments Kampung Admiralty and Admiralty Place, has a "Community" theme. Here, community spaces should encourage interactions among residents such as through community gardens or other activity spaces. Buildings could be painted in "bright and earthy accent colours" to complement a light base colour. And at the precinct level, individual housing projects can still have unique design concepts while remaining aligned with the broader themes. Playgrounds in Woodlands Central, for example, could be designed with bright colours and sculptural elements to emphasise the urban theme, while playgrounds in Woodlands East might feature kampung-inspired play equipment in the shape of animals and fruits to strengthen its community theme. HDB chief executive Cheong Koon Hean said the agency is taking the lead with the guides to align different agencies' efforts and ensure a coherent design and town identity. "In this way, we continue to strengthen the identity of each town, preserve the distinctive local flavour and deepen the sense of belonging among residents to their home," she said. 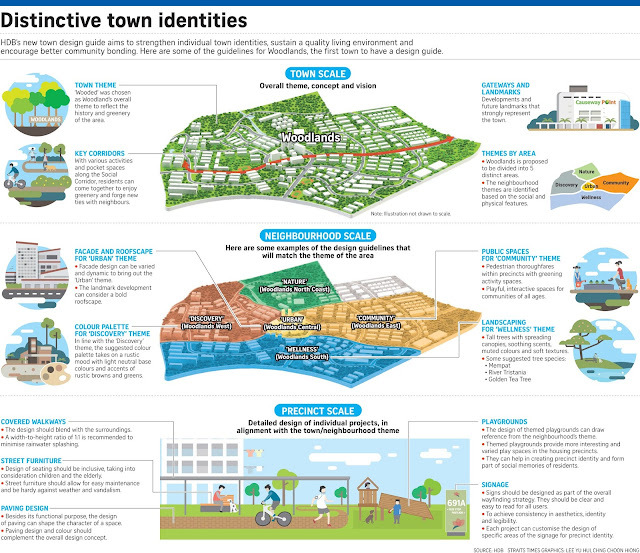 Singapore University of Technology and Design architecture professor Chong Keng Hua said establishing common principles would help develop towns with coherent identities. "When you love not just your country but also your neighbourhood, it translates into the little things, like picking up the litter," he said. "The town becomes something we love and protect."